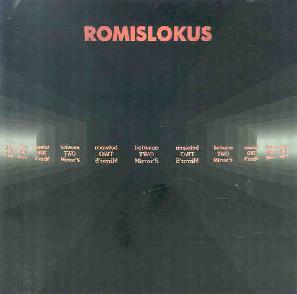 Romislokus - "Between Two Mirrors"
It's a pity more bands out of Eastern Europe and Russia don't get heard in North America, because there are some great things going on there musically. Take for example, Romislokus. They dub themselves a "project" rather than a band, and are comprised of members from a variety of backgrounds ranging from economics to biotechnology to law to computers. A few of them are also classical musicians. Their idea is to bring their diverse non-musical and non-rock backgrounds together to create a unique and diverse sound. "Music is philosophy in practice," one of the band members said in an e-mail communication. "In any case, philosophical sight on the world is the attribute of every good musician. Music helps us to live." Listening to it, I hear a variety of styles blending together, including progressive rock, space rock, orchestral sounding pop, ambient, dance, and classical, the latter due in a large part to the moody cello-playing of Irina Unakovskaya - not something you hear often in rock music. Then again, they have a relentless passion for new ideas and new sounds. "As far as the professions of Romislokus are different from each other so everyone's approach to music is different too. Common opinion is achieved with the help of a common searching for new ideas. It is created on the place of crossing of everyone's knowledge and everyone's lifetime experiences. It is very interesting: to open the way nobody walks and to use it in our songs." You may think this might lead to something so experimental that it would be difficult on the ears, but the music of Romislokus is surprisingly easy to listen too. They manage to bring a very nice accessibility to their sound without sacrificing their integrity or their goals. The songs range from the spacey opener, Cold, with it's throbbing, slow sequences and it's curious X-Files-like melody courtesy of keyboardist Evgenity Gorelov, to The Thunderstorm is Coming, an upbeat, funky groove with great accents from Unakovskaya's cello. The dark and edgy Termites is a stand out, with its eerie electronic effects, chant-like chorus, and deeply spacey breaks, and is contrasted nicely by the breezier Minute, with it's jazzy rhythm guitar and psychedelic synth sounds. Vocalist (and rhythm guitarist) Uriy Smolnikov has a rich and versatile baritone. He can sing with a deep and almost menacing resonance, then turn easily to a light and emotional delivery. Sometimes he sort of speaks the lyrics too, sounding a bit like Till Lindemann of Rammstein when he does. The lyrics are all in Russian, a choice made by the band for a reason. "To our mind the English language gives the rhythmic basis of rock song," one of the members said. "The rhythmic structure of the Russian language is different from English; that's why our music has it's own specialty." Personally, I have always enjoyed listening to music with vocals in other languages than English, even if I don't understand what the vocalist is singing about. It always lends an exotic feel to the music for me.